California. Going into the weekend we had a pretty good idea of some of the gymnasts that were definite members (hello, Simone Biles!). But, you never really know who Márta Károlyi, the US National Team Coordinator, will choose for the team. In addition to how the gymnasts placed in the Olympic Trials, and how they scored, she has to take into account the gymnasts’ consistency of performance, what events are each gymnast’s strength, and the overall needs of the team in order to put together a group of gymnasts she thinks can win the gold for the US. Simone Biles was a definite for the US Olympic Gymnastics Team going into the Olympic Trials, as she has pretty much dominated gymnastics competition for the last three years. She verbally committed to UCLA in 2014, before deciding to turn pro in 2015, forfeiting her NCAA eligibility. Biles has such difficulty in her routine, that she routinely wins by points, instead of the usual tenths in gymnastics. As if all of this wasn’t enough to secure a spot on the Olympic Team, she won the Olympic Trials competition which guarantees her trip to Rio. Aly Raisman was the captain of the gold-medal-winning US Olympic Gymnastics team at the 2012 Olympics. Raisman initially committed to attend the University of Florida for gymnastics, but instead turned Pro in 2011 and forfeited her NCAA eligibility. Aly Raisman competed in Dancing With the Stars in 2013, and now you can also see Raisman and her family on the Lifetime Docuseries Gold Medal Families. Aly Raisman took a year off after the 2012 Olympics, before coming back to the sport more determined than ever. Practice Schedule: Raisman trains for 35 hours a week. She has a morning practice from 8:30-11:15 and an evening practice from 5pm-9pm, 5 days a week. Gabby Douglas is the reigning Olympic All-Around champion from the 2012 London Olympics. After the 2012 Olympics, Gabby Douglas was basically the poster-child for gymnastics, appearing on a special-edition corn flakes box, and on the cover of Time magazine. Since then she has also published two books, Raising the Bar and her autobiography, Grace, Gold, and Glory My Leap of Faith. At 16, Laurie Hernandez is the youngest member of the 2016 U.S. Olympic Gymnastics Team. She made her debut as a gymnastics senior competitor this year, and performed well at the meets in which she competed. She is a great addition to the Olympic Team with her high-energy routines! She came in 2nd All-Around at the Olympic Trials. Madison Kocian was one of the specialists vying for the fifth spot on the 2016 US Women’s Gymnastics Olympic Team. Despite her less than stellar performance in the All-Around at Olympic Trials (she finished 8th), she won Bars. She rounds out the 2016 Olympic team well, with her exceptional bar score history, especially since bars is the only event on which Simone Biles hasn’t won a world medal. She also has the ability to contribute on other events if she is needed. The three alternates that the U.S. will be bringing to Rio are Ashton Locklear, MyKayla Skinner and Ragan Smith. 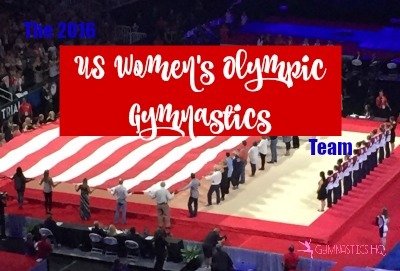 The gymnasts on the 2016 US Women’s Olympic Gymnastics Team come from different gyms, backgrounds and areas of the country, but they have one thing in common. They practice A-LOT! They have been training and practicing gymnastics for years, and now this is their chance to represent the US at the most prestigious international sporing event. They have done everything right in order to become an Olympic gymnast! Go Team USA!